Traditionally, outsourcing has been seen as a way to rapidly and dramatically cut costs especially with technology. As outsourcing IT matures, companies are also realizing that the technology they outsource still must be woven into larger, end-to-end processes that's cost efficient and cost effective. For example, sales people still must roll up into an organization's CRM system, share sales report with other team members, then dispatch emails to customers efficiently and on-demand regardless of location. 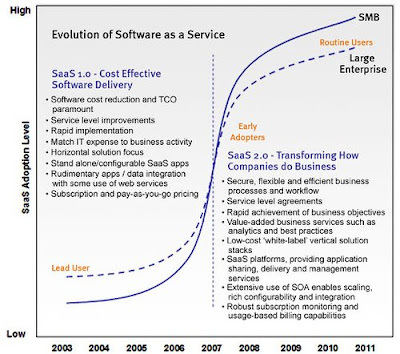 As we move into the ubiquitous adoption of Software-as-a-Server (SaaS 2.0) evolution, one thing is for sure - technology must optimize business to transform how we work in a meaningful way. From a business perspective, organizations must integrate various in-house and outsourced technology to enable seamless, reliable business process ready to scale (up or down) with minimum complexities while delivering real ROI. 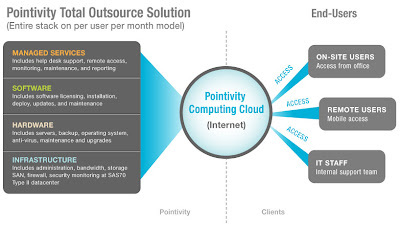 Pointivity has unified all the processes above with the best-practices outsourcing resulting in a Total Outsourced Solution from Managed Services to Hosted Services delivered on a simple per user per month OPEX model. The solution enables businesses to maintain control and focus on their core competencies while shifting all IT risks and responsibilities to Pointivity. Outsourcing can also reduce operating costs, help companies to make efficient use of technology, save on investment in hardware and software, streamline reporting to management and regulators, provide access to additional functionality, improve data security, and the list goes on! We're now offering "Total Outsourced Solution" to selected partners who qualify to private label the entire solution to their customers. I liked your post. Thank you for sharing. Immediately obvious that you know a lot about this. I've been ordering software here www.nixsolutions.com/ . Suggest to friends. Very cool site. The guys are working quickly and efficiently. I advise everyone.